An Lockheed Martin F-22A fighter has crashed at approximately 10 a.m near Edwards Air Force Base in the high desert of Southern California, the Air Force has confirmed. FORT WORTH, Texas, March 25 - Lockheed Martin test pilot David Cooley, 49, was killed today at about 10 a.m. Pacific time in the crash of an F-22 aircraft flying on a test mission from Edwards AFB, California. We are deeply saddened by the loss of David and our concerns, thoughts and prayers at this time are with his family. David joined Lockheed Martin in 2003 and was a 21-year veteran of the U.S. Air Force. He worked at the F-22 Combined Test Force, where a team of Lockheed Martin and Air Force pilots conduct F-22 aircraft testing. Questions about the aircraft accident should be addressed to the Edwards Air Force Base Public Affairs Office at 661-277-3511. Crash Site Update: Air Force officials are asking the public to refrain from entering the F-22A crash recovery site northeast of Edwards Air Force Base. The F-22 fighter jet crashed Wednesday in the high desert of Southern California, killing a test pilot for prime contractor Lockheed Martin Corp. The pilot was David Cooley, 49, a 21-year Air Force veteran who joined Lockheed Martin in 2003, the company said in a statement. It did not release any details of the accident, including whether Cooley attempted to eject. A statement issued by Edwards said first responders transported Cooley from the crash scene to Victor Valley Community Hospital in Victorville, where he was pronounced dead. Cooley, of Palmdale, Calif., was part of a team of company and Air Force pilots who conduct F-22 testing. "We are deeply saddened by the loss of David and our concerns, thoughts and prayers at this time are with his family," the statement said. Update 1430: Rescue crews were at the site in the afternoon but there was no information on the status of the pilot, Lt. Col. Karen Platt, an Air Force spokeswoman at the Pentagon said. The Bureau of Land Management identifies the area as Harper Dry Lake, a vast and empty expanse of sometimes marshy flat land. Update 1400: Downed Raptor was assigned to Edwards' 412th Test Wing and was on a test mission. The jet crashed 35 miles northeast of the base at a location six miles north of Harper dry lakebed, said Gary Strassburg, a Pentagon spokesman. He had no information about the area. Rescue crews were en route to the site and the status of the pilot was unknown, said Maj. David Small. There was no immediate word on whether the pilot ejected. Update 1320: Crash site near Cuddleback Dry Lake very rugged area...All 4WD...east of the 395 and southwest of China Lake Navel Weapons Center. Official Update 1300: 3/25/2009 - EDWARDS AFB, Calif. - Link - An Air Force F-22A fighter crashed about 10 a.m. today approximately 35 miles northeast of Edwards AFB, CA. The aircraft is from Edwards Air Force Base. At the time of the accident, it was on a test mission. One pilot was on board. Their condition is unknown at this time. As soon as additional details become available, they will be provided. Update 1238: ABC Air 7 HD is a few minutes away from the scene of a F-22 Raptor crash 35 northeast of Edwards Air Force Base. KABC should have streaming HD video soon at - Link Air 7 HD (No sound). Update: A press release from Edwards Air Force Base confirms the single pilot F-22 was based out of Edwards Air Force Base and was conducting a test mission when it crashed about 35 miles northeast of the base. Note: It is the second time that an F-22 has crashed. The first one was during the aircraft's test and evaluation period in December 2004, also at Edwards, when the pilot was able to eject safely, the Air Force said. Rescue vehicles are en route. The Lockheed Martin/Boeing F-22A Raptor is a fifth-generation, fighter aircraft that uses stealth technology. It is primarily an air superiority fighter, but has multiple capabilities that include ground attack, electronic warfare, and signals intelligence roles. The United States Air Force considers the F-22A a critical component of the US strike force, and claims that the F-22 cannot be matched by any known or projected fighter aircraft. The two-engine fighter is 62 feet long, has a wingspan of 44½ feet and is flown by a single pilot. 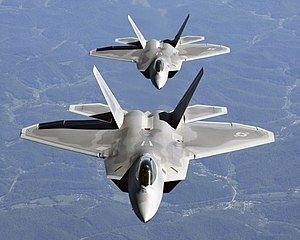 Cost per plane - $143 million (2008 flyaway cost) Each F-22 costs $143 million and there are 134 planes in the F-22 inventory, said an Air Force spokesman. The fifth-generation aircraft emerged from its testing and evaluation phase to gain operational status in December 2005.